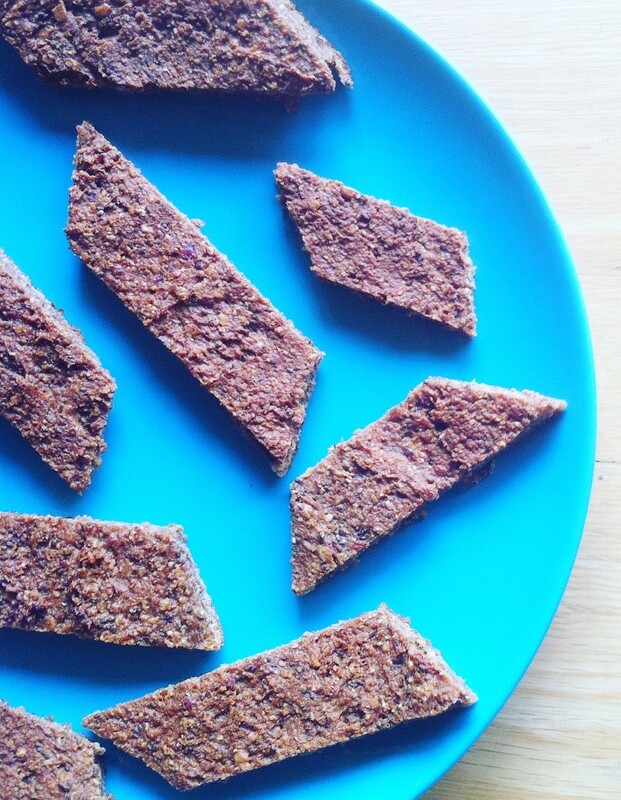 This is a quick’n’easy supercharged recipe for some sneaky superfood school snacks. Almost ran out of Ss there… If you are looking for a delicious, sweet-tasting natural health bar, this is a great recipe. Packed full of oats, seeds and nuts (if there are no allergies), and made with coconut oil and banana purée, it is a favourite of young children – and their health-conscious mammas. The superhero ingredient here is not the chia seed, but the dates, which are extremely nourishing (think of Bedouins breaking fast with dates after a long day in the desert – true story) and full of natural sugars, so there is no need to add anything more, though do stir in honey if the mix doesn’t taste exciting enough. Add crushed almonds or cashews if it’s OK to bring nutty snacks into the school, and decorate with pumpkin seeds and/or dried redcurrants. Mix chia seeds with water in a bowl until a gel forms. Place the dates, the coconut oil, the chia mixture, the banana into a blender along with the honey (if using) and blend until a smooth paste forms. Add the oats, sunflower seeds, cinnamon and cacao to a mixing bowl and stir in the blended mixture. Alternatively, you can slowly add the dry ingredients into the blender until a dough-like mixture forms (kids don’t like to see all those bits and pieces, really). Line an oven tray with baking paper and lightly grease it with coconut oil. Pour the mix into the tray and spread it out evenly. Allow to bake for about 35 minutes, until the top turns golden. Leave to cool for at least 15 minutes before cutting it into shapes. Store half of the bars in an airtight container at room temperature or on the top shelf of the fridge for up to three days, and freeze the rest for later in the month. Posted in FoodTagged kids, recipesBookmark the permalink.